POZZOLANS are a vital component in modern concrete, extending the durability of our concrete infrastructure from decades to centuries. Byproduct “man-made” pozzolans, like fly ash, have been widely used to improve concrete performance and durability over the last fifty years, but as cost and environmental pressures increase on the coal-burning industries (the sources of fly ash), concrete producers are increasingly looking for more consistent supply and quality of pozzolans. This is where materials like KMC’s HQP come in. THE NEED FOR POZZOLANPORTLAND CEMENT, THE GRAY POWDER that serves to bind rocks and sand in forming concrete, is one of the largest contributors to greenhouse gases in the world. The production of cement requires 'burning' limestone at very high temperatures. This process consumes large amounts of energy, usually a fossil fuel in one form or another. As the limestone is heated, it further releases carbon dioxide in forming the key reactive components in cement. The simplest and most valuable way to do this is through the use of a High Quality Pozzolan (HQP). Modern concrete designs routinely replace from 15 to 40% of cement content with pozzolans, with the replacement amount heavily dependent of the quality of pozzolan used. This achieves two important benefits at the same time – first, the carbon footprint of concrete is reduced in proportion to the amount of cement displaced, and second, the concrete’s lifespan is significantly increased by HQP’s proven ability to increase strength and density while also limiting damage from chemical processes like alkali silica reactivity, sulfate attack, chloride induced re-bar oxidation, freeze-thaw damage, and more. Protecting concrete through the use of HQP can extend its life from decades to centuries. And prior to the proliferation of coal-fired power plants in the last half of the twentieth century (and their resulting production of millions of tons of fly ash byproduct), natural pozzolans were the HQP of choice. Witness 2000 year old Roman concrete structures like the Colosseum and Pantheon which employed natural pozzolans with essentially the same physical characteristics and chemical composition as that available at the Kirkland mineral deposit. Imagine concrete infrastructure that did not have to be replaced for centuries! 2) NATURAL POZZOLAN is a valuable cementitious material that helps produce denser, stronger, more durable concrete, whether in your backyard patio or an airport runway. 3) NATURAL POZZOLAN will mitigate or eliminate unsightly efflorescence in concrete, the unsightly and potentially damaging white powdery substance that forms on the surface of some concrete products often exposed to wetting and drying. 4) NATURAL POZZOLAN is used to reduce the heat of hydration in mass concrete pours, like dams, nuclear containment structures or large building foundations. Without a means to reduce the heat produced by the reaction of cement and water, thermal cracking is induced which can destroy the concrete from within. This is why many older dams, like Hoover and Glen Canyon Dams in Arizona, incorporated some natural pozzolans in an age before fly ash was available. 5) NATURAL POZZOLAN will increase the long term compressive strength of concrete by 30% or more, as the pozzolanic reaction in concrete continues for many years. This enables the design of longer-life structures and potential reduction in widths of building columns and pavement thicknesses. 6) NATURAL POZZOLAN will create greater denser, less permeable concrete than a straight cement mix. This provides for greater resistance to water and chemical ingress into the concrete, protecting reinforcing steel corrosion and the concrete from attack due to sulfates carried in by seawater, groundwater or rain. 7) Extensive testing of the entire Kirkland mine site has demonstrated the consistency of its natural HQP and its superior effectiveness in concrete relative to currently-used pozzolans. HISTORY OF POZZOLANALTHOUGH OTHERS IN ANCIENT HISTORY understood the benefits of pozzolans, the Romans took full advantage of the amazing qualities provided to concrete construction. The Pantheon, after 2000 years, remains the largest unreinforced concrete dome ever constructed. 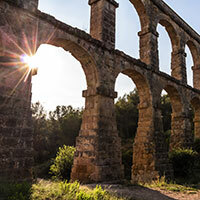 Many of the vast waterworks, the aqueducts and cisterns are still functional today. The Colosseum is a major attraction today as tourists wonder at the engineering prowess of the ancient builders. None of these wonders would have been possible without natural pozzolan, the key ingredient in Roman concrete that allowed for such unsurpassed durability. Rediscovered in the 20th century, and once again returning to prominence as a primary and vital ingredient in high quality, enduring concrete, natural pozzolan can now do for modern construction what it once did for the ancient masters. MODERN USEEARLY IN THE 20TH CENTURY, engineers rediscovered NP as they researched ways to provide permanence and strength to the massive dam projects which were required to make the western US habitable for large numbers of people migrating from the east. Overall, their efforts met with great success. Most of those early dams still stand strong and fulfill the purpose for which they were engineered, in part due to natural pozzolans role in producing durable concrete construction. 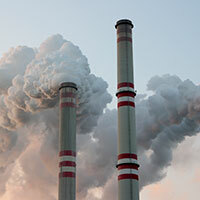 Soon thereafter, residual ash scrubbed from coal fired power plants was discovered to have similar chemistry to natural pozzolan—a sort of “man-made” pozzolan. Due to economic and political incentive to divert this abundant ash byproduct from landfills, the cement and concrete industries began to transition to fly ash to serve as their pozzolan source. With economic, environmental and market conditions aligned, fly ash effectively replaced natural pozzolans in the concrete market place over the last 50 years. Those conditions, however, are beginning to change. FLY ASH POZZOLANSTHE TECHNICAL STANDARD for pozzolans, ASTM C618, identifies two classes of fly ash—Class F and Class C – along with Class N designated for natural pozzolans. The classes of fly ash are distinguished by differences in chemical composition, usually determined by the types of coal from which they come. Class F fly ash is generally produced from burning anthracite or bituminous coals, while Class C fly ash typically comes from sub-bituminous sources. Second, due to its abundance, lower cost, and lower sulfur content, sub-bituminous coal has become an increasing source of fuel for much of the nation’s current generating capacity. Because sub-bituminous sources produce Class C fly ash, and because they also tend to carry lower overall ash contents, this large-scale move toward cheaper and “cleaner” coal has had a less positive effect on the fly ash industry – the production of less fly ash in general, and the production of less Class F fly ash, prized for its durability benefits, in particular. Of the many new power plants currently permitted for construction or on the drawing boards in the US, none are coal fired. Aside from the rapid advances and shrinking costs of renewables, the vast majority of combustion-based plants are to be powered by plentiful and cleaner-burning natural gas. One after another, coal-fired plants are being shuttered or are being retrofitted for cleaner-burning fuels in the future, further squeezing an already tight fly ash supply. One example very close to home is the 2250 megawatt Navajo Generating Station located near Page, Arizona. While serving as one of the largest fly ash supply sources in the American west, the plant is currently scheduled for decommission in 2019. If this comes to fruition, the loss of fly ash will create a rapid and severe shortfall in pozzolan supply for the southwest region. Given this situation, we believe the case, both business and environmental, has already been made. In the absence of adequate pozzlan supply, concrete producers will return to making concrete with less pozzolan, or none at all. The negative impacts from this on the environment and our infrastructure make it clear that a return to the original standard of natural pozzolans for improving concrete is the logical choice. In fact, as design specifications for many important infrastructure projects now require the use of pozzolans in concrete, the production of natural pozzolans like KMC’s HQP may become more necessity than choice.